In our interactions with others, we will sometimes find that there is a shift in the power balance between us. Often this shift leaves us feeling uncomfortable, as if something went wrong. For example, I might feel like I'm doing all the work and no matter how much I do it's never enough and you always criticise me, leaving me feeling weakened. Fortunately, help is at hand. Transactional Analysis (one of the psychology disciplines) uses a model of human interaction called the Drama Triangle, developed by Stephen Karpman. The Drama Triangle is a way of analysing our interactions into three roles and the interplay between those roles. The idea is that once we recognise the roles we play, we can make a choice about how we step out of the Drama Triangle to make our personal and work lives happier. It's one of the most profound tools in Transactional Analysis. With this in mind, we are sharing a wonderful and insightful guest blog by David Emerald who created 'TED' - The Empowerment Dynamic. David gives some great examples of sales conversations. 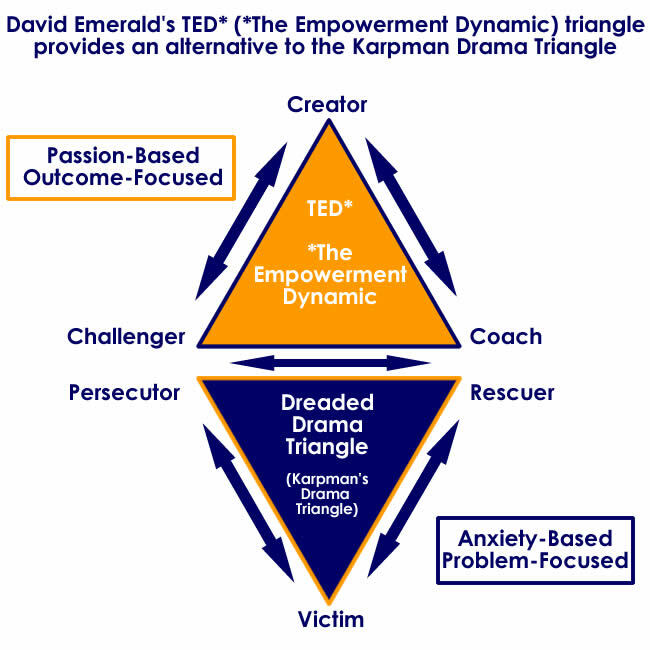 'TED' is an alternative view on the Karpman Drama Triangle. W.A.I.T. - Why am I talking? Talk is constant and pretty "cheap" these days. Anyone, anywhere, anytime can post a comment on the many social media sites and talk, talk, talk. There are over 500 million tweets each day on Twitter alone. But W.A.I.T. Ask yourself: "Why Am I Talking?" Two weeks ago we purchased a new car - our first in 12 years. Since we had not purchased a new car in a very long while, it was an opportunity to experience a wide range of talking and selling approaches as we visited several dealerships. Some were subtle - and not so subtle - encounters of the Dreaded Drama Triangle (DDT)™. We met one young man who eventually admitted it was his first week of selling cars. He talked non-stop about his experiences with cars and what he looks for when purchasing a car himself. In a subtle way, he appeared victimized by his own sense of insecurity. He talked non-stop, chattering away and seemed powerless to know how to help us. In another case we felt victimized by the stereotypical car salesman (i.e. Persecutor), who literally stood at the door with his manager, insisting that we couldn't leave their dealership until they had a chance to give us a price on the old car we were trading. Finally, at another dealership, we experienced an empowering, thoughtful and engaging sales person who treated us as Creators. He asked insightful and helpful questions and listened deeply. We felt seen, heard and appreciated. (No surprise, we bought our new car from him.) This sales person "sold" us by being a Coach in the way of TED* (*The Empowerment Dynamic)™, helping us clarify our needs and desires. And, we later realized he W.A.I.T.ed. We did most of the talking - not him. If you are unconscious to the reason you are talking, you can easily go reactive to the moment and blurt out the first words that come to mind and probably step right into either the Victim, Persecutor or Rescuer DDT role. What is my intention behind what I am about to say? Is there a question I could ask that would help me better understand what the other person is saying and perceiving? How might I simply listen and let go of my urge to talk in this moment? If we all did a little more W.A.I.T.ing and a little less talking, we believe this world would be a more empowering and co-creative place. Here is David's website where you can find out more about TED. I'd love to know your thoughts on this article and if you'd like to find out more about how using the Drama Triangle and TED can help you in selling, do get in touch and leave a comment below.